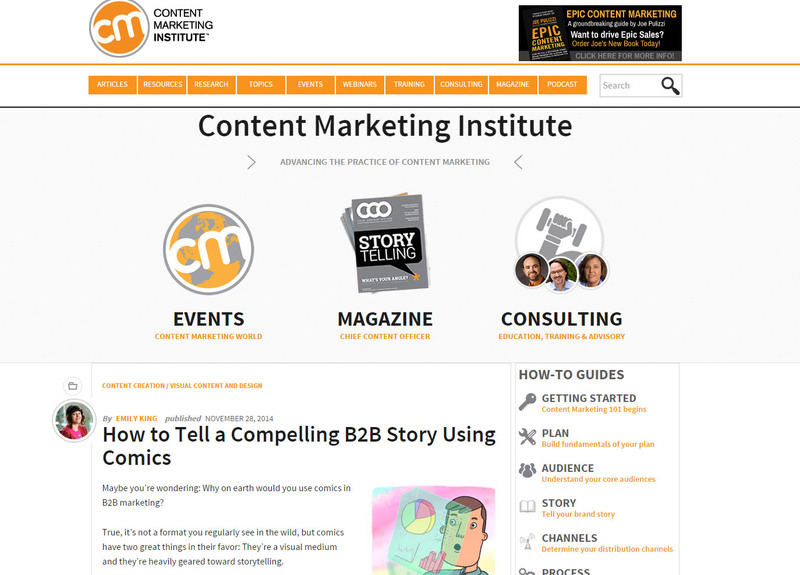 My first ever article for the Content Marketing Institute went live today. The post I mentioned last week. You can read “How to Tell a Compelling B2B Story Using Comics” here. So far it’s been shared by some pretty big names in content marketing, which makes me very happy this Friday afternoon. Two things that strike me with all of this is that the eBook I link to at the end of that piece is a) the first comic I’ve been in published since Back Row and Arthur Shilling and b) it’s a business comic. It’s just kind of strange being someone who pursues formats (from comics to podcasts) to become a professional, fiction writer/creator in them and to find that I get a lot more attention using these formats in content marketing itself. It’s like a modern day version of New Grub Street, but now writers are being encouraged towards marketing instead of journalism. When you consider the backgrounds of content creators like Ann Handley – this does seem to be the case. I’m rambling now. Anyway, if you wanted to check out the other hot piece of content I’ve had out this week, please do read my damning analysis of native advertising in B2C and B2B over on the Radix Communications blog.